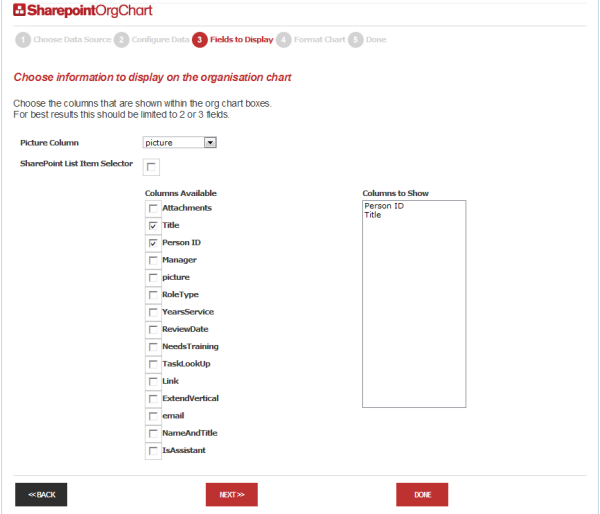 SharePointOrgChart configuration wizard makes the initial configuration of your organization chart quick and easy. 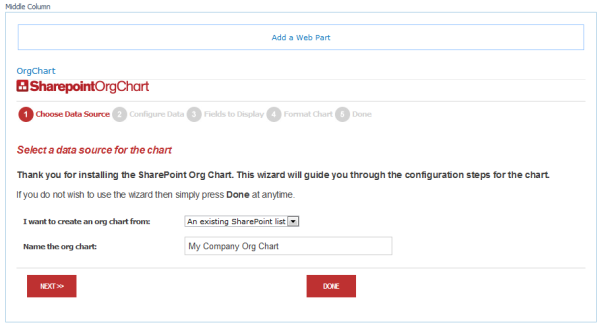 To begin first add the SharePointOrgChart web part to a web part page. The web part will be located in the Custom category. Configuring the data source - SharePoint List. If a SharePoint list is chosen as the data source the next stage will prompt to pick the list from a drop down of all available lists on the site. At this stage the Primary Key Column and the Manager column are chosen. The Primary Key uniquely identifies each person in the organisation chart. The manager column tells SharePoint Org Chart who the appropriate manager is. If the list for the chart is contained on a different subsite then it is possible to manually enter the URL and primary key and manager details. Configuring the data source - Database. 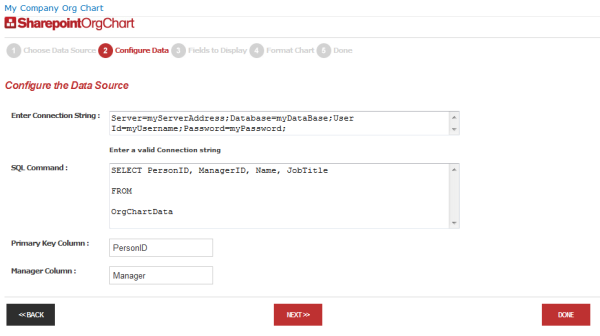 If a database is choosen as the data source the next step required is to enter a valid connection string and SQL query to retrieve the org chart data. At this stage is also important to identify the columns holding the Primary Key and Manager information. 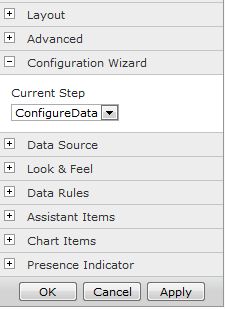 The next step in the wizard is to pick the information that you wish to display in the boxes in the organisation chart. The Picture Column can also be selected. This is the column that contains a link to a picture that will be displayed. 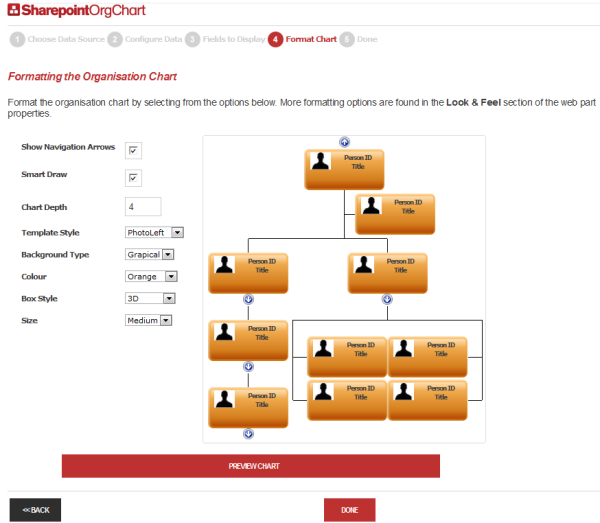 In this step an org chart containing sample data is displayed. The page author can modify the appearance of the chart and preview those changes by pressing the Preview button. 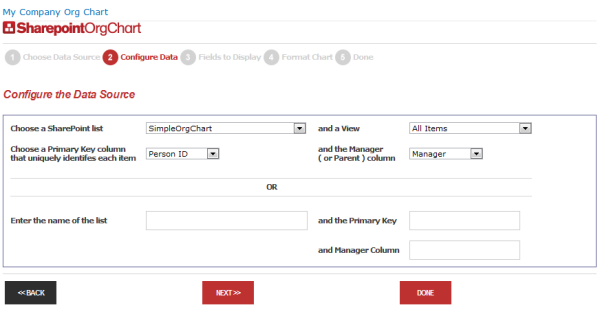 The configuration is now complete and once the page author presses Done the organisation chart will be displayed. The wizard can be restarted easily by opening the configuration panel and changing the Current Step in the Configuration Wizard property section from "Done" to the required position.